Jack Grealish attack: What can football do about pitch invaders? 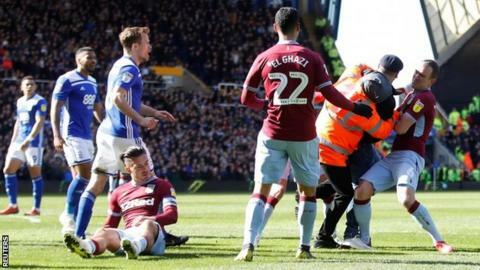 After a weekend where Aston Villa captain Jack Grealish was attacked by a fan, the Football Association is not alone in thinking that "a line has been crossed". Arrests for pitch incursions actually fell last season to 191 after a five-year rise and are way below the 333 made in 2002-03. But the incidents involving Grealish, whose aggressor has been jailed for 14 weeks, Manchester United defender Chris Smalling and Rangers captain James Tavernier have shown that fan behaviour and player safety is an increasingly alarming issue. Former Newcastle and England captain Alan Shearer has been among those to condemn the "disgusting" attack on Grealish during his team's 1-0 win over Birmingham. And it comes in a season where there have been several alleged incidents of racial abuse as well as objects thrown at players and managers. It has led to questions about whether players are safe, why there has been a spike in unsavoury incidents and whether football is doing enough to deter them. "It was disgraceful, cowardly and criminal," says Professional Footballers' Association chief executive Gordon Taylor of the Grealish incident. He says there has been an "increase in such behaviour at clubs this season" and there is now "real fear for the safety of players". Former Manchester United and Everton player Phil Neville thinks "things have been getting worse for a while" while former Villa midfielder Lee Hendrie told BBC Radio 5 Live: "It could have been someone running on with a knife." He added: "It's going to take something, that's going to cause a big, big scene in football, that's going to make people really stand up. "Why do we need to wait for that to actually happen before someone gets really hurt?" Former Wales international David Cotterill says he wants to see armed police officers helping stewards after the Grealish incident. However, football-related arrests have actually halved in the past decade England and Wales. Can football deter criminal fans? For the third consecutive year, more Birmingham City fans were arrested last season (95) than any other club in England's top five leagues. Sheffield United (62) and Sunderland (60) were second and third on the list respectively in 2017-18. Sunday's incident involving Grealish had echoes of a similar one in the same fixture 17 years ago, where Villa goalkeeper Peter Enckelman was goaded by a Birmingham fan after conceding an own-goal. When Michael Harper confronted Enckelman in 2002, he said he was "deeply ashamed" of his actions. But it didn't stop him being jailed for four months, banned from attending matches for six years and being given a lifetime ban from the club. So after a second high-profile case at St Andrews, can this type of spectator be stopped? There are concerns about the best use of police or stewards at games, with one police chief warning that violence and disorder could increase unless clubs cover policing costs. Mark Roberts, a deputy chief constable with South Yorkshire Police, told BBC Sport last year: "We have fewer police officers in football grounds; clubs are cutting costs for policing and backfilling with stewards who don't have the same authority." Others say that football is only mirroring society. After Brighton issued life bans to three fans in January, deputy chairman Paul Barber said: "One of the worrying things is I don't believe this is just a football problem." But he told BBC Sport: "We don't want to be a magnet for it - so we will do our small part to keep it away." Would points deductions or behind-closed-doors games work? Shearer is among those who think that Birmingham should receive the "strongest punishment possible" after the Grealish attack. "I think we need points deduction or playing games behind closed doors because someone is going to get hurt," he told Match of the Day 2. Some fans argue that this could be manipulated, where a supporter could pretend to be from another club and get their rivals punished, although an investigation should be able to root out where a fan's true allegiance lies. Amanda Jacks, who leads on stewarding and policing issues for the Football Supporters Federation, says deducting points would not be "fair and reasonable, or proportionate." She told BBC Radio 5 Live: "Why punish a whole football club for the actions of one mindless individual?" Taylor also believes that playing games behind closed doors or even talking about perimeter fencing would be the wrong course of action. He wants "effective sanctions" and believes the answer to improving poor fan behaviour may come from getting the government involved as it did in the 1980s when hooliganism was at its peak. Sports Minister Mims Davies said the weekend's incidents were a "disgrace" and "every possible step must be taken" to preserve player safety. But if more stringent sanctions do not arrive, Rangers boss Steven Gerrard says he might take power into his own hands and withdraw his players from the field. "It's certainly a decision I would support if any of the players - my players or opposition players - were at risk," he said. Christopher Stanley: They are incidents we don't want to see but we are talking about rare incidents, [at] less than 1% of matches a pitch intruder will incur. So surely we are doing something right otherwise the numbers would be higher. Bit of perspective please. Dan, Brighton: Make the purchase of a tickets a 'contract of behaviour' with the club. If fan invades, club gets fined but then can sue the fan responsible for damages due to them breaching the contract. Matt: The problem isn't security at football grounds it's with the fan culture. I can't think of another global sport that still allows this tribal mentality to persist. NFL, Cricket, Rugby....why do football fans still need segregating? By modern standards they are still in the Dark ages. The people are the problem and it needs fixing. Phil, Aberdeen: I don't think there needs to be a complex solution to a simple problem. Why don't clubs not sell tickets for the front three rows closest to the pitch? Stewards can identify potential threats earlier and more obviously with clubs minimising lost revenue/outgoing costs. Mike: South American stadiums used to have moats around the pitch. Surely clubs could be given incentives to install these. Chris: No fences or moats, it's not a zoo. Life ban + minimum £1,000 fine plus whatever criminal charges are pressed. Even idiots understand money, so hit them in the pocket. Jason Falzon: People calling for fencing at stadia to stop pitch invasions. Please remember that England had those very fences removed after Hillsborough to help avoid a similar tragedy. A fan invading should have been stopped by those tasked from the home side.